Shanthi, was the quintessential human being, multi-talented, multi-faceted and multi-tasking. A sparkling jewel, in looks and thought. A mother who had time to bring up 3 children who are sensitive and interested in the world around them. She had time for them, no matter where she was – while on the field or at home. Her husband, by her accounts of him, was her soul mate in his ideology and whole hearted immersion in social development. An architect by profession, Shanthi turned her eye and training in creating and fashioning a better world for Sri Lankans and the world around her. She asked for no less and no more than an equitable Sri Lanka for all, irrespective of ethnicity, religion and gender. Her training ground in development was a father, who was left oriented (she was listening all the time to issues of a serious nature, seated on his knee) and a mother who was a giver, generous to the core and wanting to feed any and everyone who visited their home. Her siblings were all of quick mind. Shanthi was an indefatigable development worker during the height of the conflict, traveling the length and breadth of the East and then the North. Working for an international NGO, Shanthi visualized and formulated many a program for the empowerment of women affected by the conflict. After a tortuous circuit of learning and experience, engaging in different think tanks and being on the board of a number of organizations dealing with human rights and development, she gave birth to her fourth child, which was the Viluthu Centre for Human Resource Development. Viluthu, meaning the roots of a banyan tree, which puts down roots in many places, so was the concept of Viluthu. Starting dialogues, seeding change, among the underserved in remote areas of Batticaloa, Trincomalee, Jaffna and then Pullalam, for self realization on one’s status of life, learning about what one is due –rights, and to go forth and demand. In a nutshell this is what Viluthu was about. The work was concentrated towards women. The study circle approach was pioneered through Viluthu, targeting mainly women. Shanthi was happy in her last years, where the communities quantified what they had gained and converted these results in terms of monetary value. It was a huge sum. Forming a Widows network and obtaining resources of all types was her dream and she accomplished it with her team. Another was the launch of a product brand, of food and food stuff and other ecofriendly products made by women, especially widows. Through a program supported by the World Bank small grants, this launch too was accomplished. Shanthi was never afraid to venture into new territory and the Sanjeevi program was all about food and nutrition. So from advocating for rights and increased political participation for women, she successfully turned Viluthu in the direction of food and nutrition security. Never content to lie still even for a moment, Shanthi, through Viluthu was successful in starting activities on combating religious intolerance, going as far as writing successful proposals to educate young Buddhist monks. 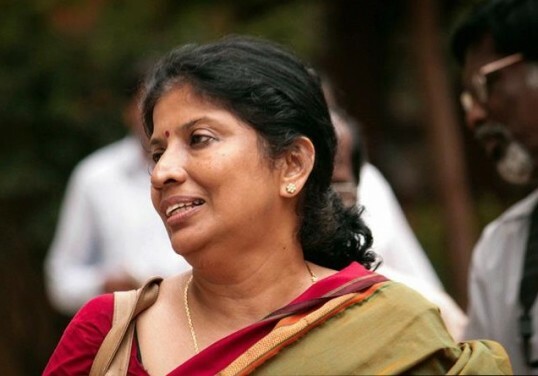 Shanthi was actively involved in Citizens for a Secure Sri Lanka (CSSL), a loose network of concerned citizens, where her generosity drew the network into lots of activities on child safety, religious intolerance and many other interventions. She was generous enough to anchor CSSL and to host it within Viluthu. In fact this was Viluthu, a haven to meet and discuss, its shade given without reservation to civil society. Her total interest, underpinning all the activities implemented, was politics. Her firm belief was, that for lasting change, politics and politicians, should be mature, clean and visionary and that one must enter politics in order to contribute to meaningful social change in a substantive manner. This small account is but a dot in the landscape of change, envisioned by Shanthi. The writer was in touch with her daily, on matters of work and sharing titbits and a friendship that blossomed in a short span of time, about 3 years. The friendship was the most important aspect in addition to a fruitful working relationship that dealt only with matters technical. This is a beautiful appreciation. May Shanti soon attain the peace of Moksha. May she be safe in Samsara. May her family have the strength to take this untimely loss. Shanti was a wonderful lady committed to morality and justice. Shanthi Sachithanandam was an honourable woman. She worked tirelessly to promote the western agenda to bash Sri Lanka and put a glossy spin on LTTE mass murder of innocent civilians including children. She was an honourable woman who admired Prabakaran as a demigod. She was a beneficiary of generous NGO funding for her hard work. She was an honourable voice of the Tamil civil society. Off the Wall describes the role of the Tamil church in the northern conflict very well. The North had duplicitous and highly political bishops and Jesuit priests (Rayappu Joseph, Deogopillai, S.J. Emmanuel etc) serving western interests. But Sri Lankan nationalism was also to blame with its own set of lies and myths. Now with China entering turbulent economic weather and likely to be internally preoccupied given its precarious financial system, the Sinhalese uber nationalists, with no real roots themselves (Mahindapala, Dayan Jayatilleke, Bodu Bala Sena, discredited UPFA allies), have no where to turn. They are boxed-in with an American supported regime in Colombo that will be well financed and likely to serve its full term. Its time for reconciliation. Remarks such as by Off the Wall are in very poor taste. They are typical of a narrow minded mentality that brought Sri Lanka to it its present place to begin with. I will remember Shanti for her support to poor women be they Muslim, Tamil or Sinhalese. The appreciation is authored by a Sinhalese which reveals how many appreciated her good will regardless of ethnicity. May she attain Jannathul Ferdous. I do not know you, and I did not know this lady either. Please refrain from saying things like this. It is wrong. If you had a grievance you should have raised it when she was alive, not now. @Off the wall, if a Government acts like a government, the people of the country don’t have to go around criticizing it. So according to you, the people of SL have to shut up and keep quiet when they are being slaughtered by an elected government? we had a hoodlum who was the president for 9 years. All that carnage and blood shed has not opened your eyes? This tells me your family is quite safe and maybe worked for the previous government and minted money through dodgy deals. Muslim Women’s Research and Action Forum(MWRAF) was one of the first organisations to identify her talents and her commitment to gender equality. MWRAF conducted a workshop on the topic Women and Media in 1990. She had just returned from India – young and bubbling. What she wrote at that time on portrayal of women in media is still valid. Thereafter I had the opportunity to work with her on the status of the women workers in the plantations. She inspired those who worked with her. I have worked with her in many programmes and I am happy and privileged to have been associated with her. Apart from her commitment to women, she would entertain us with her singing and hilarious jokes. Jokes had no malice. Many people would not know the fact that she acted in teledramas too. She went too soon no doubt.A selfless person who gave her time and energy for others-The less fortunate. I admired Shanthi for practicing in her own simple life her convictions about humanity and People.She dedicated her life to serve the down-trodden and spoke up in our Meetings on their behalf. Here we go, the endorsement straight from the horse’s mouth. I am sure Visakha Tillekeratne wrote this appreciation to celebrate the life of Shanthi Sachithanandam and not Father S.J.Emmanuel. Visakha, Thank you for a INSPIRATIONAL article! I hope someone can create a wikipedia entry for her Legacy? Anyone? Thank you for writing this appreciation Vishaka. There is much that can be done if the good people of our communities reach out to each other and foster good relations among the different people. Shanthi was a great and beautiful soul.She bore no ill will to any person.The only occasion she felt distress was when she saw injustice and that too she would deal in a composed and collected manner.Recently when she came across an incident of sexual harassment by a superior officer at the office of an organization(not Viluthu), Shanthi as a member of the Director Board put her foot down and insisted on compliance with zero tolerance policy to such harassment and the officer’s services was discontinued.Such was her commitment to justice,fair play and gender equality. She was brave.Never a person to compromise on principles,she will have her say politely but firmly whether it is palatable or not to others.In her there was a happy blend of old school values and touch of modernity ,charm ,exuberance and erudition .Shanthi was a complete human being.We will never see the like of her again. Thank you Visakha for penning a meaningful appreciation. Shanthi and I were batch-mates in the department of Architecture at University of Moratuwa. For the first year project on designing a kitchen, she designed a kitchen for a shanty which had stone hearth and a nail on the timber plank wall to hang a bag. She defended the design for 30-minutes and the crit panel gave her A+ for articulating the social space so nicely. She was a gifted singer and it was a joy to have her on batch trips. At the annual musical show of 1979 she sang “Amudeyi Padiyum Nilave”. In 1989 we formed a group comprising colleagues who were not supporting established political parties to contest at Student Assembly Election. I was the only batch-mate present at her funeral. President Maithreepala Sirisena had sent a message of condolence. A schoolmate of Shanthi delevering an eulogy quoted Bhagawan Sathya Shri Sai Baba; “Hands that serve are better than lips that preach”. Well in fact till death the mission of Sahnthi was to serve the down trodden. May she attain the peace of Nirvana.